How many know about the database MarieDB? The database is growing faster and faster. It takes market shares from MySQL. Why just from MySQL? MarieDB is a drop-in replacement for MySQL. It means that we can access and work with as it was a MySQL database. The differences between them are improvements made in MarieDB. Among the people that stand behind MarieD is Michael “Monty” Widenius the creator of MySQL. The issues with MySQL license model have pushed more and more corporates and individuals to switch to MarieDB. The future of MySQL can now be questioned, especially when Oracle is involved. I have the honor to know Roberto Mensa via Linked In. He is strongly committed to explore, develop, improve and to discuss formulas in Excel. The site is fully dedicated to Excel formulas. If You’re serious about MS Excel then this site is a must. Of course, he is not alone, another great contributor is Krisztina Szabó aka Kris. Anyway, You may start at the following point: E90E50 fx. The link points to the main page. However, the latest contribution is Combinatorics using Excel formulas. Make sure You have some hours free to take part of the contribution. Don’t forget to bring coffee to the computer. Enjoy and have a nice Easter Weekend! As part of my maintenance, in order to keep the computer fresh, is to regular run the built-in tool Free up disk space. Yes, I admit it was some time ago since I last executed the clean up process. However, I cannot understand how Temporary Files can grow to a size of 30 GB? 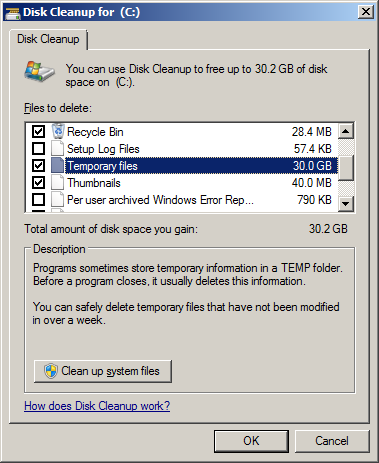 In addition, does anyone know if it exist a small utility that can automatically clean up Temporary Files? The general recommendation is to not forget to run the Free up disk space on a regular basis!